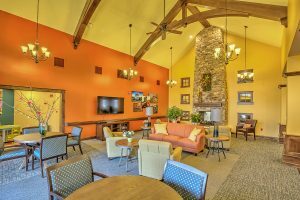 At Stillwater Senior Living, we don't want to alter your life for our convenience. Our residents won’t have to conform to a regimented schedule. Open dining and personalized assistance plans help you have the flexibility you desire. We offer as much or as little help and interaction as our residents need, and we work with families as residents’ needs change. Communication between our team and your family is key as we come together in an extended family. We want to hear what is important to you. We want you to continue to grow and learn as we support you in pursuing your goals. Help us incorporate your unique history as we build our future together by sharing your recipes, traditions, pictures, and dreams. Our 46 apartments include studio, one- and two-bedroom suites. They were designed with security features, maximum accessibility and include walk-out patios and a full range of amenities for the whole family. Assisted Living – Our amazing staff can provide personal care assistance, supervise medications, clean apartments and provide meals. We also offer recreational, social activities, and apartment maintenance. Our beautiful facility has ample parking for residents who can drive as well as scheduled transportation for when you want to leave the driving to us. Concierge Services – Our amazing staff will also be able to offer a menu of services that you may find helpful in your day-to-day life. We will have a fully appointed beauty salon and spa on site for your convenience. We can help you care for your pets. Our Wellness Coordinator can accompany you to Doctor's appointments. Our team can even assist with scheduled personal shopping.